William Whitney (1683-1720) is #260 on my Ahnentafel List, my 6th great-grandfather, who married #261 Martha Pierce (1683-1759) in 1706 in Watertown, Massachusetts. * their son #130, Samuel Whitney (1719-1782) who married #131 Abigail Fletcher (1720-1783) in 1741. "(IV) William Whitney, son of Nathaniel Whitney (3), was born May 6, 1683, married, May, 17, 1706, Martha Pierce born December 24, 1681. He died January 24, 1720. He resided at Weston, Massachusetts. He was also the ancestor of the other Whitney families of Winchendon. Children: I. William, grandfather of Amasa Whitney, of Winchendon, father of Elisha M. Whitney, born January 11, 1707, married Hannah Harrington, Mrs. Mary Pierce, Margaret Spring and Mrs. Sarah Davis. 2. Judith, born November 15, 1708. 3. Amity, born October 6, 1712. 4. Martha, born April 4, 1716, married in Sudbury, February 26, 1734, Timothy Mossman; settled in Ashburnham. 5. Samuel, see forward." The Whitney book, written by Frederick Clifton Pierce, summarizes the William Whitney family with similar information. William Whitney was born 6 May 1683 in Watertown, Massachusetts, the third child of Nathaniel and Sarah (Hagar) Whitney of Watertown[1-2,7-8]. The family farm of Nathaniel Whitney was located in what is now Weston, Massachusetts, which separated from Watertown in about 1713. He married on 17 May 1706 in Watertown to Martha Peirce of Watertown, daughter of Joseph and Martha (--?--) Peirce[3-4]. They had five children born between 1707 and 1719, all recorded in Watertown and Weston. On 20 February 1715/6, William Whitney, husbandman of Weston, sold land in Weston to Joseph Lynde of Charlestown for 30 pounds in good and lawful bills of public credit. One parcel of 40 acres was one half of a farm bounded east by heirs of John Warrin Jr. and Daniel Warrin, north and south by Squadron lands, and west by the abovesaid William Whitney. Another parcel of 3 acres of meadow land was one half of a parcel recently purchased from Edward Harrington of Watertown, bounded east by Daniel Warren, and on all other sides by the farms of Nathaniel Whitney and Samuel Whitney. William Whitney died 24 June 1720 in Weston, as recorded in the Weston town vital record book. No burial location or record is known. His widow, Martha Whitney, and Nathaniel Whitney Junior of Weston, were named administrators for the estate on 4 July 1720. Bond in the amount of 300 pounds was posted by Martha Whitney, Nathaniel Whitney Junior and Nathaniel Whitney senior, all of Weston on that date. An inventory of the estate was taken 5 August 1720 by John Warren, Benoni Garfield and John Warren; the real estate, comprising one mansion house with 34 acres of land plus five acres of remote meadow land, 47 acres of upland and 3 acres of adjacent meadow land, was valued at 360 pounds. The personal estate was apprised at 115 pounds, 17 shillings, 11 pence. The first account of the administrators was filed 21 July 1727. They charged themselves with the personal estate. Several parcels of land were sold by order of the court to Eben Chadwick, John Warren, and John Warren Junior in order to pay debts to several people. The balance was 41 pounds, 12 shillings, 5 pence after paying the debts and charges, which included 40 pounds to the widow Martha for subsisting for seven years with five small children. An additional inventory dated 24 March 1728 was filed and approved for the remainder of the estate, which included payments to John Whitney and Nathaniel Whitney. The probate records also contain a guardianship bond of 200 pounds posted by Martha Whitney and Jacob Peirce on 15 August 1720 for Martha to be guardian of her five children, William in his 14th year, Judith in her 12th year, Amity in her 8th year, Martha in her 5th year and Samuel in his second year. Another guardianship bond of 300 pounds was posted by Lebbeus Graves husbandman and Jonathan Graves housewright, both of Sudbury, for Lebbeus Graves to be guardian of Amity Whitney daughter of William Whitney of Weston, by her choice, on 31 March 1729. 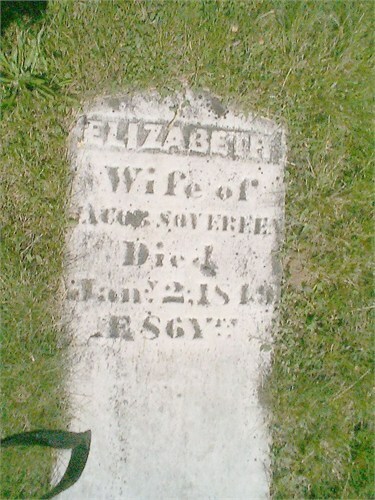 Amity Whitney married a Lebbeus Graves of Sudbury in 1730. 1. Ellery Bickell Crane, editor, Genealogical and Personal Memoirs of Worcester County, Massachusetts, with a history of Worcester society of antiquity (New York : Lewis Publishing Company, 1907), Volume 4, page 129, William Whitney sketch. 2. Frederick Clifton Pierce, The Descendants of John Whitney, Who Came from London, England, to Watertown, Massachusetts, in 1635 (Chicago : 1895)., page 43, William Whitney sketch. 3. Watertown Records, Comprising the First and Second Book of Town Proceedings, with the Land Grants and Possessions. etc. (Watertown, Mass. : Watertown Historical Society, 1894), Volume 2, page 23, William Whitney and Martha Pierce marriage entry. 4. Mary Frances Peirce, Town of Weston. Births, Deaths and Marriages, 1707-1850. Gravestones-, 1703-1900. Church Records, 1709-1825. Appendix and Addenda, Centennial Society (Boston, Mass. : McIncloe Bros., Printers, 1901), page 580, William Whitney and Martha Peirce marriage entry. 5. Mary Frances Peirce, Town of Weston. Births, Deaths and Marriages, 1707-1850. Gravestones-, 1703-1900. Church Records, 1709-1825. Appendix and Addenda, Centennial Society, page 10, William Whitney death entry. 6. Record books of the registry of deeds, Middlesex County, Massachusetts, 1649-1900; indexes: grantee (1639-1905) and grantor (1639-1950); 1780 rolls of microfilm, Family History Library, Salt Lake City, Utah, Volume 17, page 638, William Whitney to Joseph Lynde, recorded 20 February 1715/6, accessed on FHL Microfilm US/CAN 0,554,007. 7. Watertown Records, Comprising the First and Second Book of Town Proceedings, with the Land Grants and Possessions. etc., Volume 1, page 53, Willyam Whetny birth record. 8. Massachusetts, Town and Vital Records, 1620-1988, digital images, Ancestry.com (http://www.ancestry.com), Watertown Births, Marriages and Deaths, Page 95, Willyam Whetny birth record, image 167 of 3991. 9. Probate Records 1648-1924 (Middlesex County, Massachusetts), 886 rolls of microfilm, Family History Library, Salt Lake City, Utah, Probate Packet 24,763, William Whitney of Weston, 1720, accessed on FHL Microfilm US/CAN 0,432,082.